At almost every event or workshop we attend, parents ask our team members the same question, “How do I encourage my child to learn about coding?” While there are a number of great learn-to-code resources available today, Scratch is our go-to suggestion. Each week we’ll be posting a new tip or tutorial for learning how to code in Scratch. Follow along as we explore this great coding resource together. If you’ve never heard of Scratch before, Scratch is a programming language created in 2006 by the MIT Media Lab to encourage younger learners to learn basic coding skills using this simple, yet powerful, tool. Scratch also has a large online community where Scratch-users can share their creations, exchange ideas, and work collaboratively on new projects. 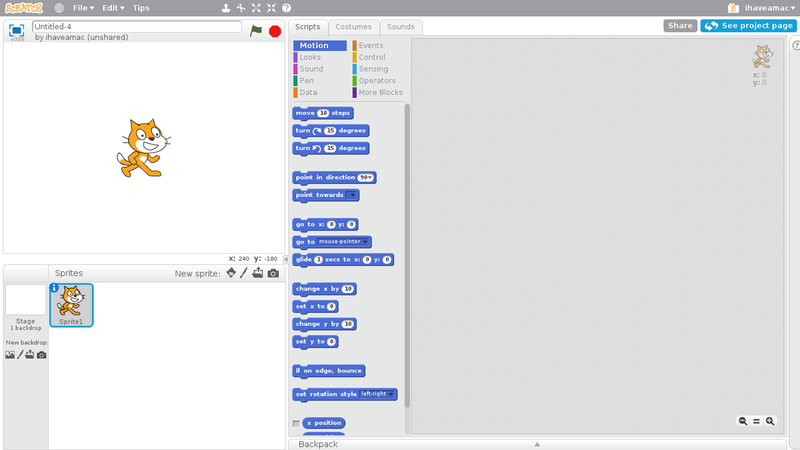 You can code in Scratch either using their online tools, or by downloading the Scratch Offline Editor. Since Scratch is primarily web-based, it means that the tools run on most internet-connected computers. Currently Scratch is not available on mobile devices, but the Scratch team is working on a tablet app and an HTML5 version that will run on smartphones and tablets. Scratch uses a visual coding interface that allows users to combine interlocking puzzle pieces to create commands. For example, you might connect MOVE FORWARD with LEFT ARROW KEY to create an object that moves forward when you press the left arrow key. This is what the Scratch interface looks like. When it comes to learning Scratch, the best way to start is by jumping in. Scratch offers a great interactive tutorial that walks users through the basics of getting started. In this tutorial users learn how to make the Scratch cat mascot (seen above) dance and play music. It only takes about 5-10 minutes to complete the first tutorial and we highly recommend trying it if you’re interested in learning more about Scratch. The tutorial launches the first time you launch the Scratch Creator. If you want to see videos of Scratch in action, or see some tutorial videos, check out the official Scratch channel on Vimeo. Next week we’re going to explore creating your first program in Scratch. Until then why don’t you check out of on-going Scratch creation – MakerBus: the game. Each week as we offer more tips and tutorials, MakerBus: the game is going to get more and more complex. It will grow alongside our new blog series. If you liked this article, why not follow the MakerBus on twitter (@DHMakerBus) or like us on Facebook (/dhmakerbus)? We post some of the most creative maker projects found on the web every day. If you #getonthebus, we promise a fun ride!